The Ferrari 458 Spider—the newest convertible by the extraordinary Italian brand—is being boasted by the company as a true competitor with other open-top Ferrari legends such as the Cabriolet and Barchetta. While all convertibles allow customers to mix the pleasure of driving with the beauty of nature, the Ferrari 458 Spider removes the archaic drop-top design and replaces it with a retractable folding hard ceiling. Subtle design improvements and the massive yet standard Ferrari power beneath the hood ensure that the 458 Spider stays ahead of its competitors in luxury and performance as well as in architecture. The 458 Spider’s 4.5-liter GDI V8 engine has the perfect amount of power, 570 horsepower to be exact, and is quiet enough to not drown out the peaceful chirping birds or the excited squeals of the passenger to your right. Even more impressively, the GDI V8 engine received the International Engine of the Year award in 2011 from a panel of automotive journalists because the engine features redesigned inlet tracts that allow for a more intense engine soundtrack when the roof is up and a much quieter experience when it is retracted. The ultra-light chassis of the sleek machine was created at the Polo Scaglietti facility in Modena, a respected source of aluminum fabrication, with the help of in-house Ferrari technicians as well as associated universities and international partners. The amount of skill and care placed into the production of the chassis has made the Ferrari 458 Spider one of the lightest and, surprisingly, safest convertibles in the world. Although the 458 Spider does not sport a visible roll-bar, the beam stiffness has been increased by 23 percent from Ferrari’s F430 and is able to carry the entire weight of the car. Speed and luxury are synonymous with Ferrari, but safety is Fiat CEO Sergio Marchionne’s primary concern. In the true spirit of a racecar, the 458 Spider is easily controllable by the driver without the need to ever remove their hands from the steering wheel. This design system, which Ferrari has dubbed the Human Machine Interface, includes the extremely popular seven-speed plus reverse F1 dual-clutch gearbox with which shifting time takes less than a third of a second, there is no torque interruption and specific attention has been placed upon the gear ratio of the first and last gear. While the Spider 458 is a more relaxed and comfortable Ferrari, the inclusion of the Human Machine Interface allows for drivers to experience the impressive power of Ferrari racing in the palms of their hands. With the amount of precision, care and racing ingenuity built into the 458 Spider, it is undeniable that Ferrari will continue its legacy of quality while also introducing the brand to those who do not want to buy a full-on racecar. With a wealth of personalization options, carbon-ceramic breaks, reduced drag and increased down force, Ferrari’s 458 Spider will certainly put smiles on the faces of participants when it debuts at the 2013 Frankfurt Auto Show on September 10to September 22 this year. 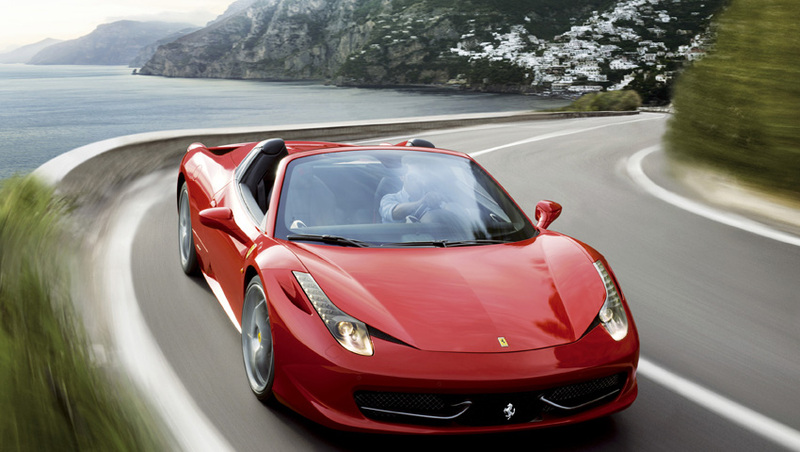 Keep your eyes locked on the 458 Spider or it will leave you and its competition in the dust.